Ouch! The so-called Pirates of the Amazon have released a Firefox add-on which automatically searches the infamous torrent site The Pirate Bay for CDs & DVDs you're currently viewing on Amazon.com. Based on this, the add-on knows that the product is indeed available on the Pirate Bay. It then embeds the "Download 4 free" image in the original Amazon page (it's quite likely that Greasemonkey is used for this). The image is linked to the first torrent file on the page, i.e. the one with the highest number of seeders. Nice and simple. Any questions? PS: don't ask me for the add-on. This stuff is certainly illegal and is simply demonstrated for informational purposes. My point is: we need multiple legal offers that are simple, non-intrusive and reasonably priced. I believe Amazon is going in the right direction (as explained in yesterday's post) but piracy is here to stay. Right or wrong, that's the way it is. 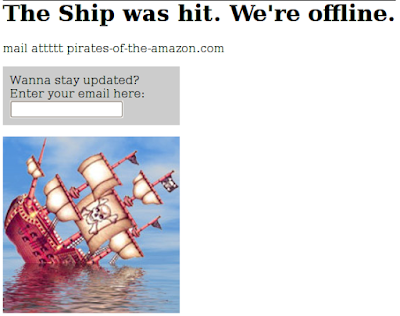 Don't you think the Pirates of the Amazon just react to the Amazon legal (and payable) offer?